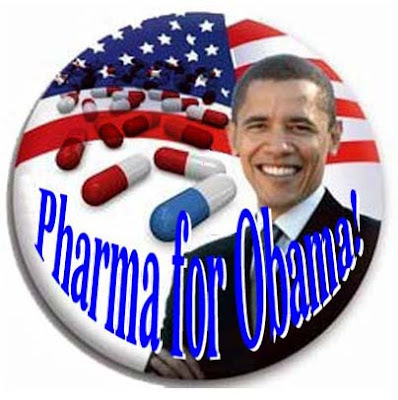 Pharma Marketing Blog: Pharma for Obama! So far, Barack Obama is the choice by far of the US pharmaceutical company respondents to my Obama vs. McCain Survey -- 46% of these respondents say they intend to vote for Obama, whereas 27% favor McCain. Another 27% are undecided. "I'm still waiting to see who McCain picks as his running mate before seriously considering either candidate," said one undecided respondent. "I'm not so passionate one way or another yet to make my decision at this point." "The stakes on the environment, national security and the overall economy are too high to put them in the hands of McCain who is economically illiterate, pugilistic and will continue the Bush policies," said an Obama fan. "While I think Republicans in general are more favorable to the industry, I believe that intelligent, nuanced policies will be more likely to be championed by Democratics, ones that will preserve IP and foster innovation while enhancing our overall economy and increasing healthcare access for all." What do you think? 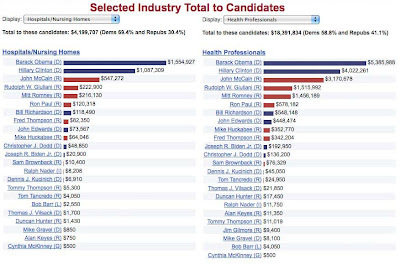 Is Obama or McCain better for pharma? Take my survey and vote today! Unfortunately, contributions by PACs may not accurately reflect the total contributions received by candidates. 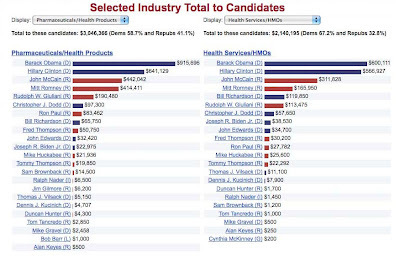 The figures certainly don't include personal contributions by people employed in the healthcare industry.